This section is updated daily, please refresh your browser every time you visit. completely documented. Call for details. Over Allowance on Lease no include rebate in the calculation. More BHPH reports Large File Cache for Accounting Files, makes recalling an account faster. New Colors!just click on the blue background of your home screen and it will change color!, (up to 5 choices) this will change the home screen (deal calculation), Customer, Vehicle and Misc Info screens, and if you save the deal it will save it with the new color! This will help you mark your quotes and it will also help when you are working on more than one deal at the same time, by selecting a different color for each one. New Help for MTD reports. Added color to BHPH, Improved show all (red cross on lower right corner) so the top of the screens do not hide above the top of the desktop. Payment Date; if you change the payment due date (misc info) on a lease to a date before the sale date, the program will change the sale date to match and warn you instead of jumping a hundred years. Hide the Invoice in vehicle Info, now a single click on the Invoice Label will hide the amount, you can drag the mouse over to see it, or open the repair order section, a second click restores the Invoice. Prompt for Date on Forms Explorer for those un-dated pre saved deals, Multiple form print, You can select up to 18 forms at a time (use ctrl button or drag mouse over many forms). New Quick save warning on print, you can save your deal when you print your forms. New option Not to save deal when printing (advanced defaults number 64), Marine Inventory fix to price Boat Trailer & motors. Updates to Master Pad, you can now print multipage signature ready PDF's you can now print directly to a monitor laid flat on your desk table, an ipad android or any other device capable of displaying pdf's, Additions to the payment book wich now can also print to PDF directly without extra paper waste. Introducing the New Full Screen View, with a cross that holds the main home screen, Customer, Vehicle and Miscellaneous Screens together, you will notice a red cross on the lower right corner of the home screen, click it and you will see the other screens appear, move it to drag all 4 screens, mouse over to update all info, you can undock to resize, and drag over the cross to re-dock. of drop down boxes listing all your printers, select the printer for the form, and the one you want to be the default after, once you made the selection, simply click the set default button, this update install an additional program to set defaults after the installation. Fix on Default printer setup. More W7 updates(fixed MTD issue). New E-mail Setup The program can send e-mails in the background, get reports of sales and payment receipts, send a quick message to your customer, more to come soon, Fix on multiple form printing. New added 2 more drop down boxes for Month to date reports. Now you can Charge a credit card right out of the program, with selections of Down Payment, Pickup Payments or Monthly Payments wired directly to Charge It! Upload your reports to your favorite Web site in one click, you can FTP a report directly to the web. Okidata made new drivers for Windows 7 64 bit Now you can print 33 inch long forms! More BHPH report changes, new faster way to Accounting Files. 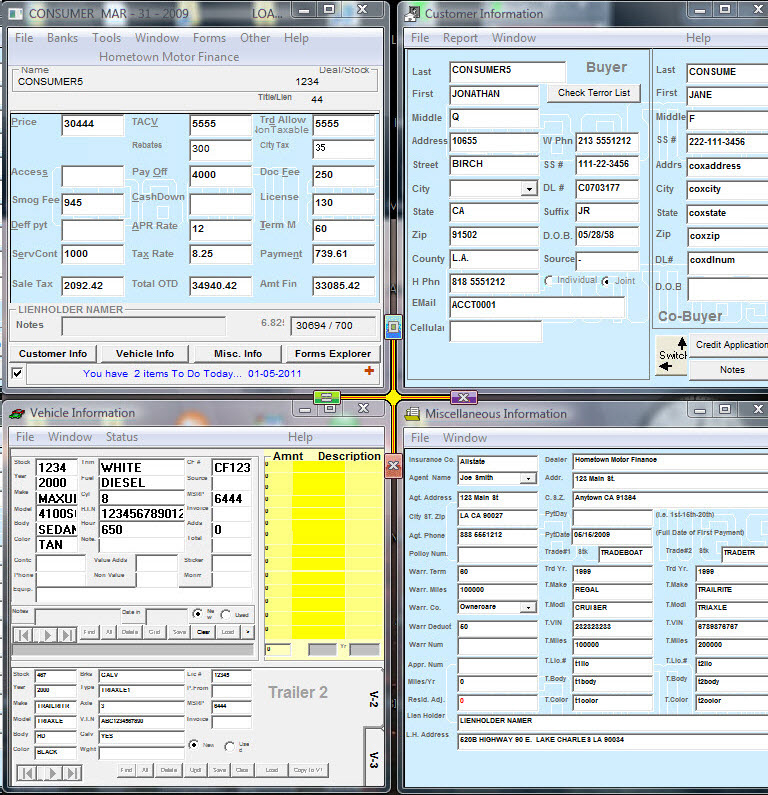 New Disclosure, Print Screen and Accounting reports on multiple notepads. MetroII now includes accounts moved to the charge off folder, so they no longer appear in other reports but continue to report bad accounts. You can now go directly to accounting files from the home screen. New faster Accounting reports, removed redraw between date entries, New Lease Module features, charge Lic Fee, Doc Fee and Certificate on Cap cost, (toggle between in cap and Drive off for each. cover the entire screen or as small as a square inch, the program also remembers the last positions and a check box lets you toggle between an open layout and a stack of windows. More Metro 2 Adjustments and failsafe's, New CSV option for some accounting reports. Grid adjustments, duplicate lease,date range report BHPH-regional settings- option to exclude lease doc fee tax from cap reduction tax in cap. Loan Tax on Payment option(Deferred Sales Tax)! Added Insurance pyt to Lease & LHPH Insurance & Fines Tracking. Lease rollback to residual, Insurance Agent List fix. Repair order colors fix.More BHPH report tweaks.Paid acct bill warning fix More BHPH LHPH reports Backout Pyt, Additional field for name of person posting a payment. New! Fuel savings comparison to show the time it would take to recover the higher cost of a more fuel efficient vehicle. Look for it in the Other Menu below the cash conversion calculator. New! Terror List Check, In your Customer Information Module, Just click the button and see the report FREE! LA Trailer Tax . PA Cap red tax. Recall Cust.Info across network fix. BHPH failsafe added to prevent unsaved sold file in accounting. MTD reports added e-mail field- New Message Box, Type SAY HELLO, or SAY DON'T TOUCH, or SAY followed by anything on the choice box to see a message on the screen, could help avoid the loss of a calculation or to give a customer a message like "Your request has been denied"
Additional Weekly Lease Payment Adjustments for terms not matching monthly terms. More work on auto saving of trade-in in inventory, New TUB report DateTUB will let you pull a Total Unpaid Balance as of any date. New Browser in the Help Menu, we have noticed that trying to type a web address is more and more difficult with the newer browsers and search engines, you start typing a www address and the search tries to send you elsewhere. This one is one you can control.Std Rpt fix on BHPH. This update includes updates to the Export to Quickbooks option on the File Menu and Month to Date Reports. This module will export Invoices, Bills and Journal Entries directly to Quickbooks. This will also require installation of the Quickbooks Importer Click Here to Download. Works with Quickbooks 2003 to 2008. The demo will work with the Quickbooks demo and Loan Master demo file only. Also new, Drop down Warranty Company information and Insurance Agents, features that help avoid repetitive input. And the new Cosigner Date of Birth variable. Also the Customer City, State, Zip and County, and a feature to copy the address to the Co-Buyer.Compliance additions to the Deal Menu. Enter your repair orders in Quickbooks and send them directly to your inventory database, Click Here to Download the new Quickbooks Exporter. Now you can also export your BHPH Invoices and payments directly to Quickbooks LMW 2008.EXE. Additions to F&I Menu (LoJack, Cilajet and wheels&tire), Recap addition, Save Store Safeguards, MTD wildcards, wholesale, retail options, and Inventory store w/o asterisk prevention. 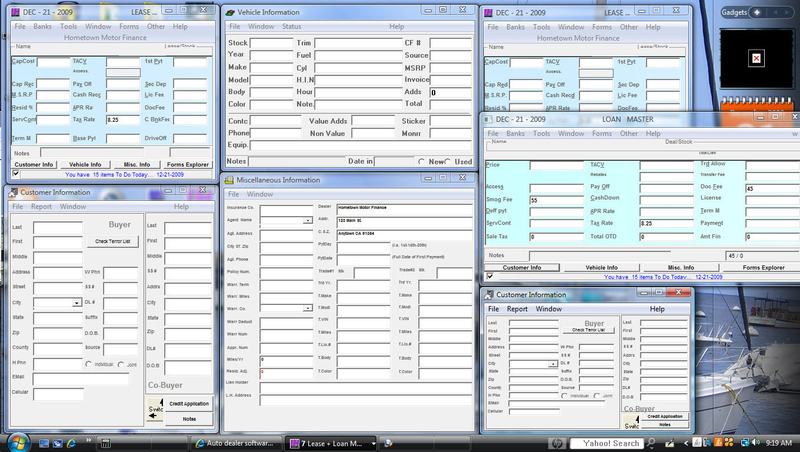 VIN Decoder, check digit, Make and Year, simply double click the VIN to load or check the info. Amount Financed rollback improvements, print receipt, recall customer into deal fix. New Wholesale/Retail Status Export to separate QuickBooks accounts or class, Export Quickbooks Checks directly to repair orders with or without internal invoices. when you change term from monthly to weekly or bi-weekly the program will calculate the new number of payments based on the monthly term. with Vista, get ready for amazing results! Journal Entries directly to Quickbooks. This will also require installation of the Quickbooks Exporter Click Here to Download. 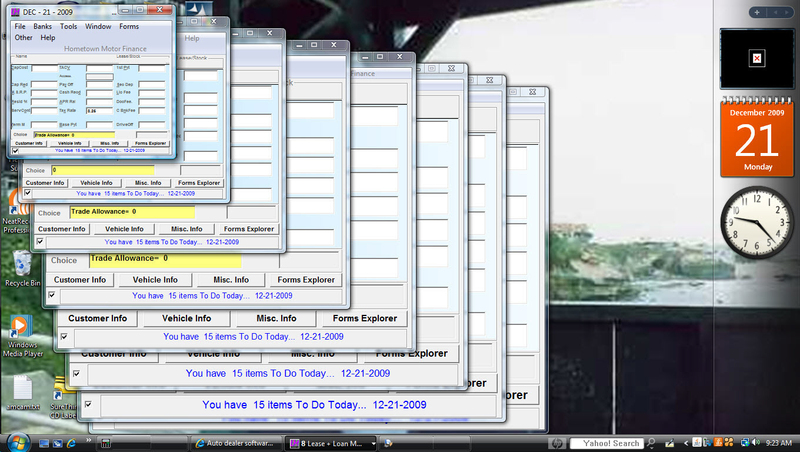 Works with Quickbooks 2003 to 2008. The demo will work with the Quickbooks demo and Loan Master demo file only. Customer Cellular Phone input field. MTD total net & this month fix. New Disclosure Page for Loan Master Purchase Module. New compatibility with XP Sp2 version of Windows, fixes Wordpad interface for notes. Select the asc file you created with KarPower and select the vehicles you want to import. 16 bit (Windows 98)Master Form Maker Use this to print a grid on any new form you need programmed and carefully fax it to 818 4885155. List of Features Added from 1998 to 2003- Click Here! Menu selling and 3 vehicle inventory!